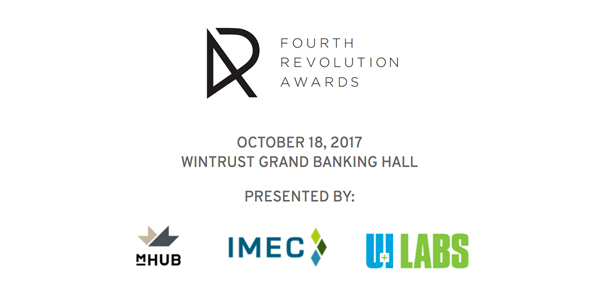 CHICAGO (September 27, 2017) – mHUB, IMEC and UI LABS have named GE Manufacturer of the Year and JLL Corporate Champion of the inaugural Fourth Revolution Awards and announced finalists in all other award categories. The industry awards ceremony will take place on October 18, 2017 at the Wintrust Grand Banking Hall in Chicago to recognize talent and achievements in regional manufacturing. GE continues to innovate world-changing products and services while investing in local communities. GE Healthcare and GE Transportation are making significant investments in the city having located their headquarters and hundreds of new employees in Chicago. GE was a key founding partner of the Digital Manufacturing and Design Innovation Institute, DMDII, at UI LABS and mHUB.